Please Contact State Senator Steven Glazer, and Assemblywoman Rebecca Bauer- Kahan and Assemblyman Tim Grayson! Ask them to expedite the installation of the 77 Bike Turnouts (Project#2019-05). 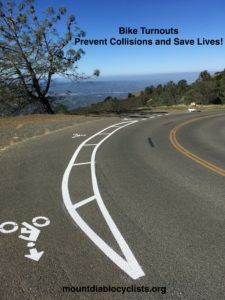 We believe that the ultimate goal of preventing Bike vs. Vehicle Collisions, and the potentially fatal consequences thereof, more than justifies the significant investment.